offers a new interpretation of the dynamic of Weber’s career as historian, social-economist, methodologist and sociologist. 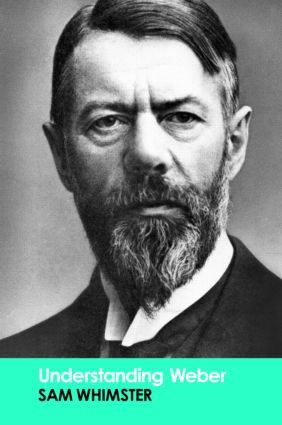 Weber's sociology still stands as a successful and valid underwriting of the substantive fields of power, law, rulership, culture, religion, civilizational configurations, and economic sociology. At a time of the turning away from grand theory to empirical policy studies, this book asserts the authority of Weber's conception and calls for a critical engagement with his legacy in order to understand the dynamics of a globalizing modernity. Thisis an indispensable guide to Weber's writings and will be an invaluable companion to The Essential Weber (2004). The book closely tracks the development of Weber’s thinking, an exploration that will make it an obligatory choice for undergraduate and postgraduate students as well as researchers in the fields of sociological theory, economic sociology and cultural studies. "In creating, single-handedly, a new genre for the appreciation of Weber - simultaneously didactic, contextual and (mostly) comprehensive - Sam Whimster's achievement is considerable…Whimster's book is indispensable." "Understanding Weber by Sam Whimster brings together more than a decade of cutting-edge work in Weber scholarship since the late 1990s…All of the most important developments in Weber research over the last ten to fifteen years are surveyed, collated, and interpreted in this extremely informative and fluently written volume."